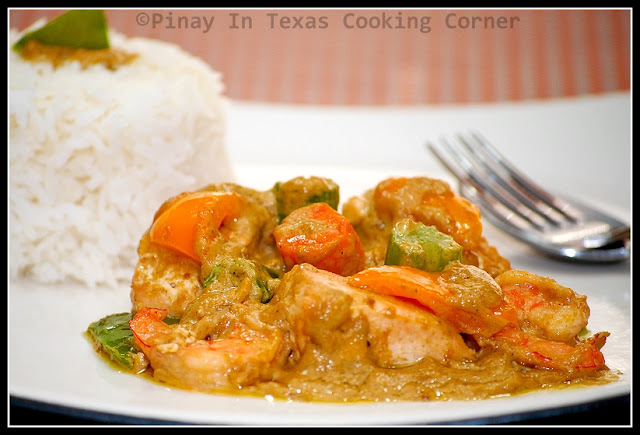 Today, I'm going to share with you my Salmon and Shrimp Curry. It's one dish that I cook often because Ryan and I love it so much. Curry is derived from the Tamil word kari, which means sauce. It has been a generic word used to describe a variety of spiced dishes. 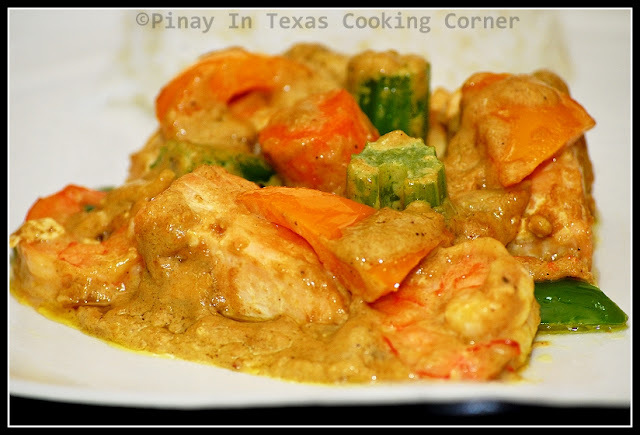 In the Philippines, a typical curry would usually be pork or chicken cooked with potatoes, bay leaf, and sometimes carrots to complement. I grew up with my mother always cooking chicken curry using curry powder. 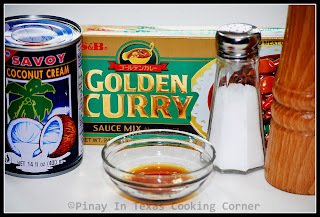 After Ryan's series of trips to Japan when he was still with NESIC Phils., I was introduced to Japanese curry, the curry sauce of which is most commonly made from instant curry roux which is available in block form and was first introduced by S&B Foods. He used to bring home boxes of S&B Foods' Golden Curry Sauce Mix from Japan, and he would cook curry rice or beef curry for me. 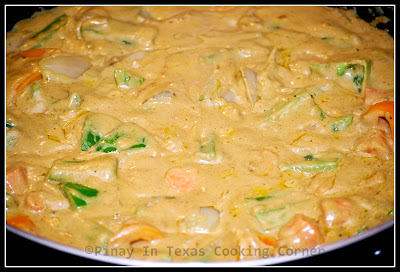 Since then, Golden Curry Sauce Mix has been part of my pantry, and I've tried it with almost everything...from pork, chicken and beef to vegetables and seafood! But we love it best with salmon and shrimps! Here's the very simple recipe...which is oh SOOO YUMMY! *I'm sharing this on Fat Camp Friday, Friday Potluck@EKat's Kitchen and Feed Me Friday. 1. 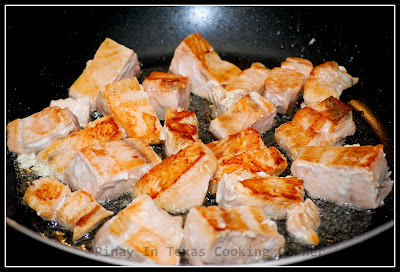 In a skillet over medium heat, fry salmon pieces in olive oil until light brown. Remove from skillet and set aside. 2. 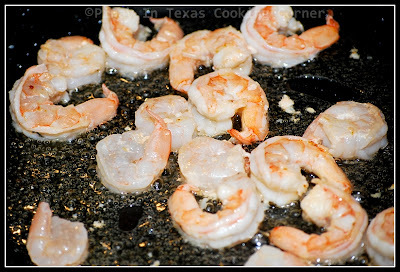 In the same skillet, sauté shrimps just until they turned pink. Remove from skillet and set aside. 3. Sauté garlic and ginger in the same skillet until light brown. 4. Add onion and curry cubes. 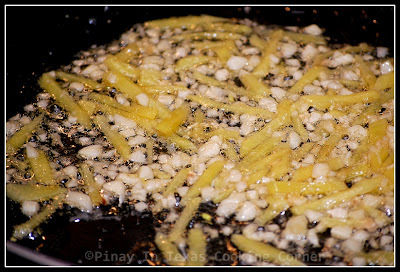 Sauté until curry cubes are melted. Mix well. 5. Pour in fish sauce and coconut milk. Mix well. Season with salt and pepper to suit your taste. Lower heat to medium low. Cover and simmer for 3 minutes. 6. 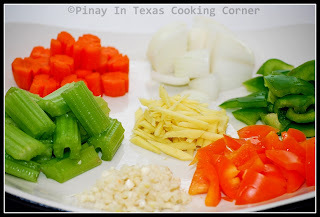 Add celery, bell peppers and carrots. Simmer for 5 minutes or until vegetables are almost cooked. 7. 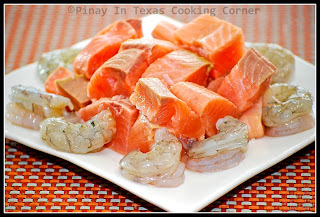 Add cooked salmon and shrimps. Gently cover with sauce. Cover and simmer for another 3 minutes. 8. Remove from heat. 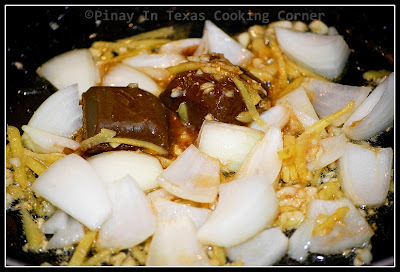 Serve with hot rice! Lovely curry Tina and for us, esp my hubby its his fav, what do you expect, being Indians, its part of what we eat. Our curries are for sure more spicy with plenty of chillies inside. 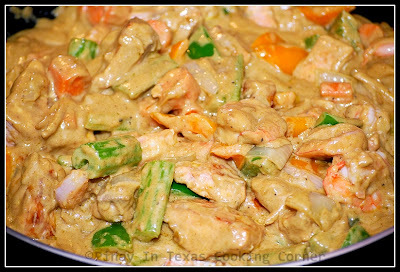 This seafood curry looks absolutely yummy! It is good that you sustain from meat a few days during week. all doctors suggest that for a good health! @Nava: I know hah! My hubby and I want it more spicy...but because I want my girls to enjoy it too, I don't put chillies on my curry. Wow. That looks FANTASTIC! I wonder how I could get my husband to try it...maybe if I don't mention the word "curry"! I love the step by step guide...perfect for people learning how to cook. By the way, thanks for commenting on my Friday Potluck / Fat Camp Friday post, as well as following my blog. Hopping here to follow you back thru GFC. Your series really looks inviting, i feel like grabbing some :), Love curry but not much of Indian Curry... it's too strong! Thai and Japanese will do, happy weekend! Visiting from A Latte with Ott A. Congrats on winning the Clabber Girl giveaway! I cook salmon about once a week and can't wait to try it out. But there is no way we can go meatless ever. We love the protein and nutrients beef, chicken, pork and dairy give us. I'm a new follower via GFC. Love the use of salmon in the curry dish, it's a nice change. I usually grill it or bake it in the oven. Your recipe is so much more interesting. The curry sauce looks so creamy and delicious. is that curry cube available here in US? Yes, Sheila. You can buy it at Walmart Asian Section and of course, at Asian stores in your area.